Scallops is a four year-old golden-laced Wyandotte hen. 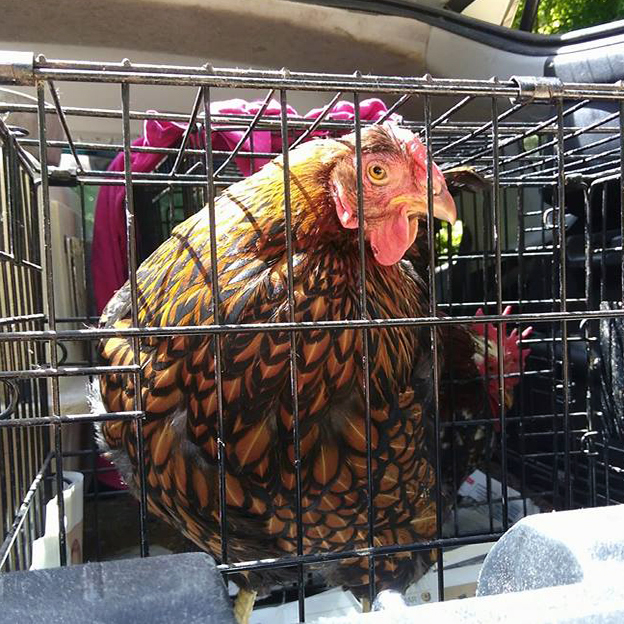 She has been a resident of Hen Harbor (HH) Sanctuary for just over two years. Scallops and two other hens, were abandoned by a backyard chicken owner who refused to care for them anymore. Over the past two years, Scallops has tended to stay under the radar, spending the majority of her time hanging out with the other egg factory farm hens and one of the hens that she originally came with to HH. Scallops had her own special roosting spot in the chicken coop. Each night, she roosted on the highest perch, in the area directly adjacent the light switch. 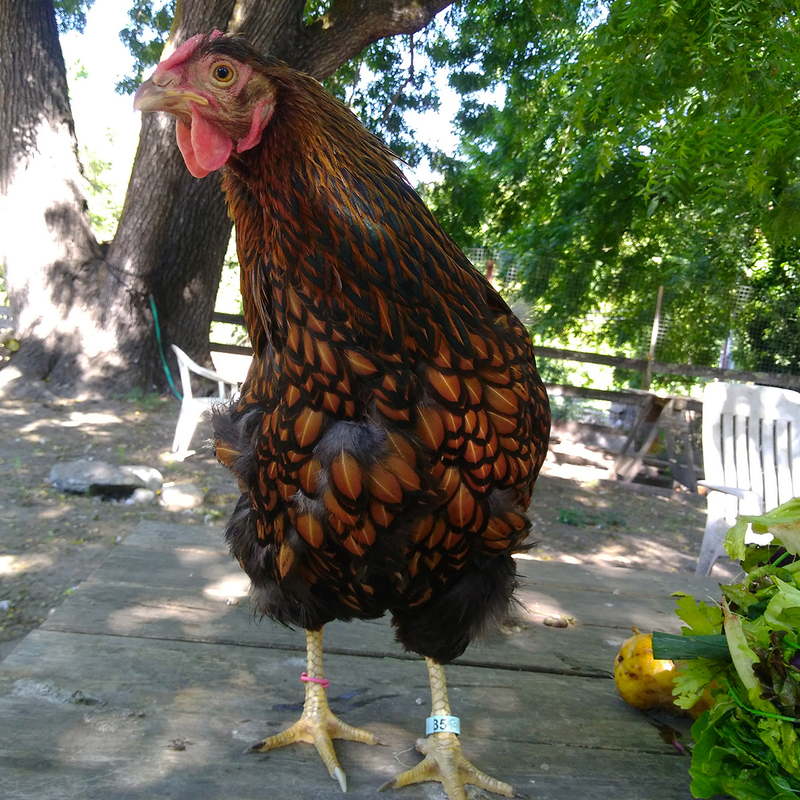 However, over the past several months, there was something slightly unusual about the way Scallops would position her body as she roosted; she appeared as if she were standing up slightly, ‘too straight’ on the perch---often a sign of reproductive issues in hens. 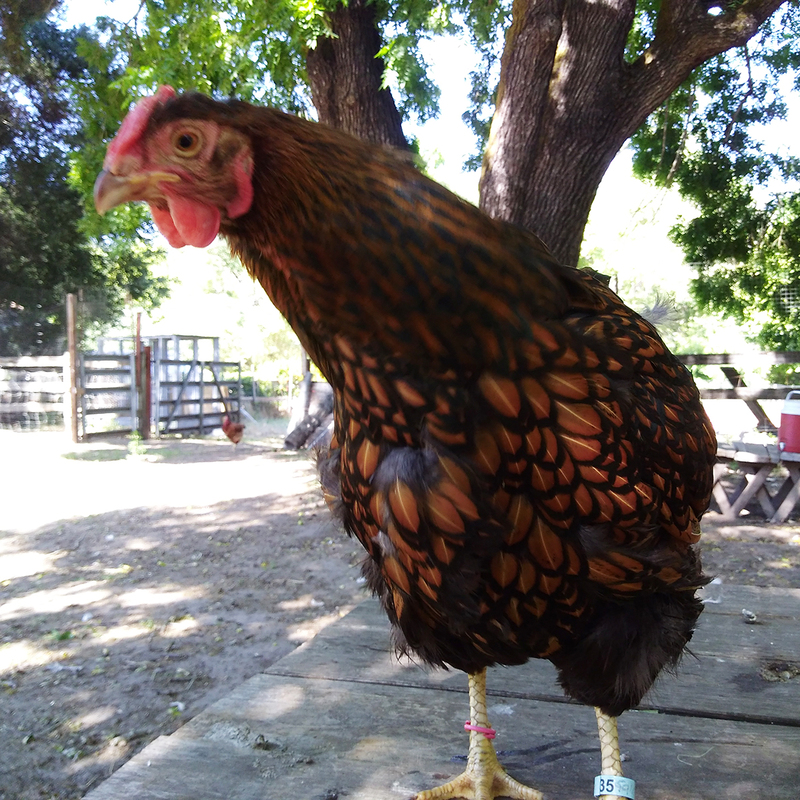 Every two to three weeks, Ariana (the founder of Hen Harbor) walks around and checks on the roosting birds at night---by lightly palpating their abdomens, to feel for anything abnormal (For older hens, and during warmer weather conditions, Ariana checks the hens’ abdomens daily). One Sunday evening, upon palpating Scallops’ abdomen, Ariana noticed the presence of a hard, egg-like mass. Scallops was immediately brought inside the house and into the Sanctuary’s designated chicken critical care area. Once situated inside, the artificial light inside stimulated activity in Scallops. Ariana sat nearby and watched how she behaved. Scallops appeared like she was struggling to lay an egg and had a distended abdomen. Ariana rang her veterinarian, Dr. Shannon Thomas, from the Avian and Exotic Clinic of Monterey to discuss what was happening, and to get her advice on what she should do to hold Scallops over until the following day. 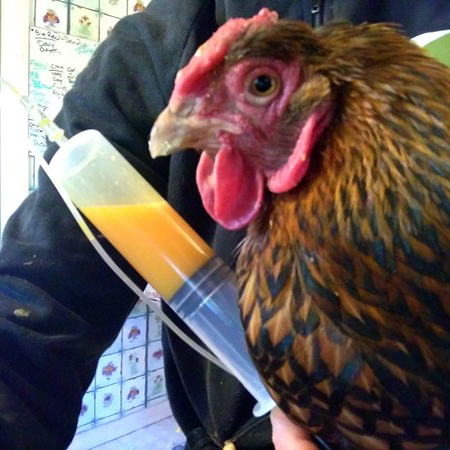 Dr. Thomas recommended administering her a dose of oral anti-inflammatories (Metacam), a calcium injection, followed by some supportive techniques (10 minute soak in a shallow container of lukewarm water, blow dry, and rest on a heating pad). Fortunately, the following day turned out to be ‘Medical Emergency Monday’ for the Sanctuary (it is the day HH brings their sick residents to the Avian and Exotic Clinic of Monterey for their weekly vet exam). Ariana brought Scallops along as well. At the Avian and Exotic Clinic, Dr. Thomas performed a physical exam on Scallops, while inquiring about her history from Ariana. 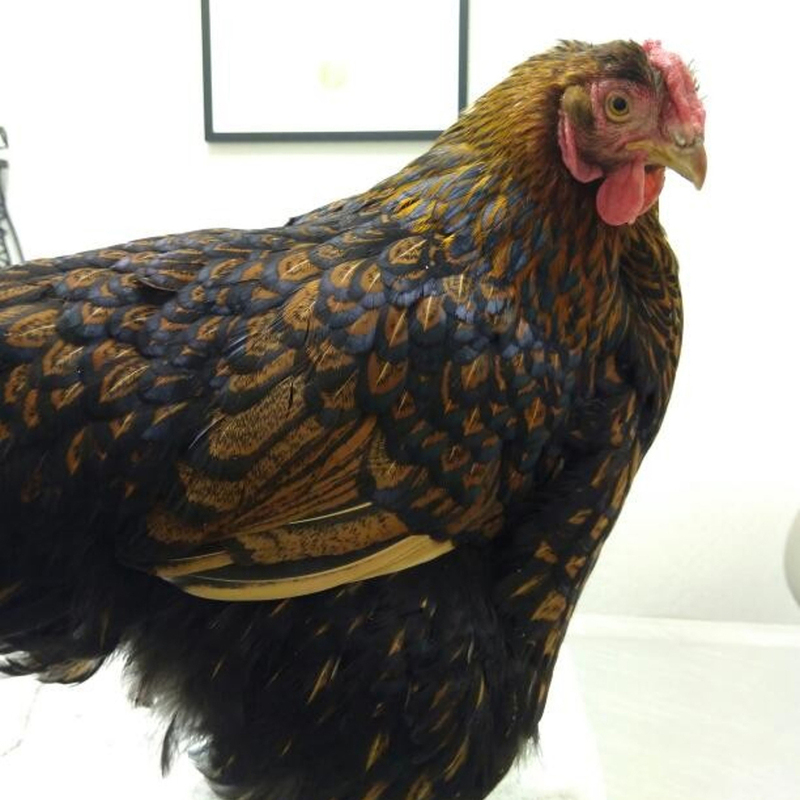 During the exam, Dr. Thomas palpated the hen's abdomen to see if she felt anything abnormal. She did not detect the presence of the hardened egg mass that Ariana felt the previous evening. She asked Dr. Thomas how this could have happened. Dr. Thomas explained how the hen could have either pushed out the impacted egg mass or it could have migrated further up her reproductive system and adhered to the oviduct itself (which is a life-threatening emergency). Following the physical exam, Dr. Thomas did an ultrasound of Scallops' abdomen to try to get a better idea of what was happening inside of her. 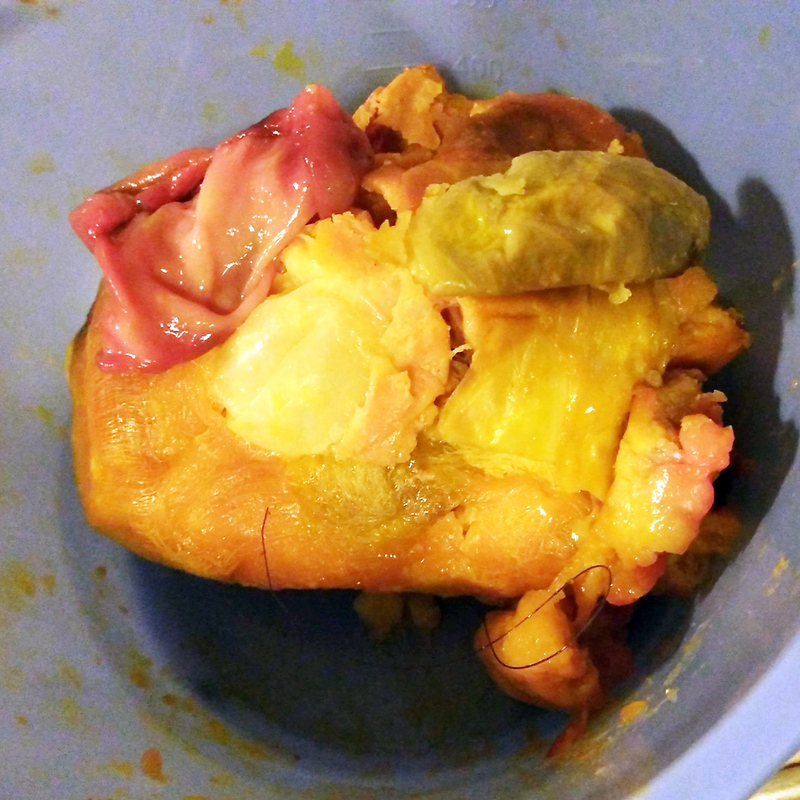 Upon review of the ultrasound, and based on the findings in her physical exam of Scallops, she recommended exploratory surgery on the hen in a week. The reason for the delay was because Scallops had a higher chance of surviving the surgery if her overall health status improved. Dr. Thomas recommended that Ariana continue the same supportive care and medication she had been administering, and to also consider tube feeding, on an as-needed basis. Once back at the HH Sanctuary, Ariana started Scallops on antibiotics, a calcium injection, and additional vitamins. As the week went by, Scallops' health seemed to progressively deteriorate. Ariana would sometimes witness the hen chirping in distress and appeared to be in pain. Finally the day of Scallops' surgery arrived. 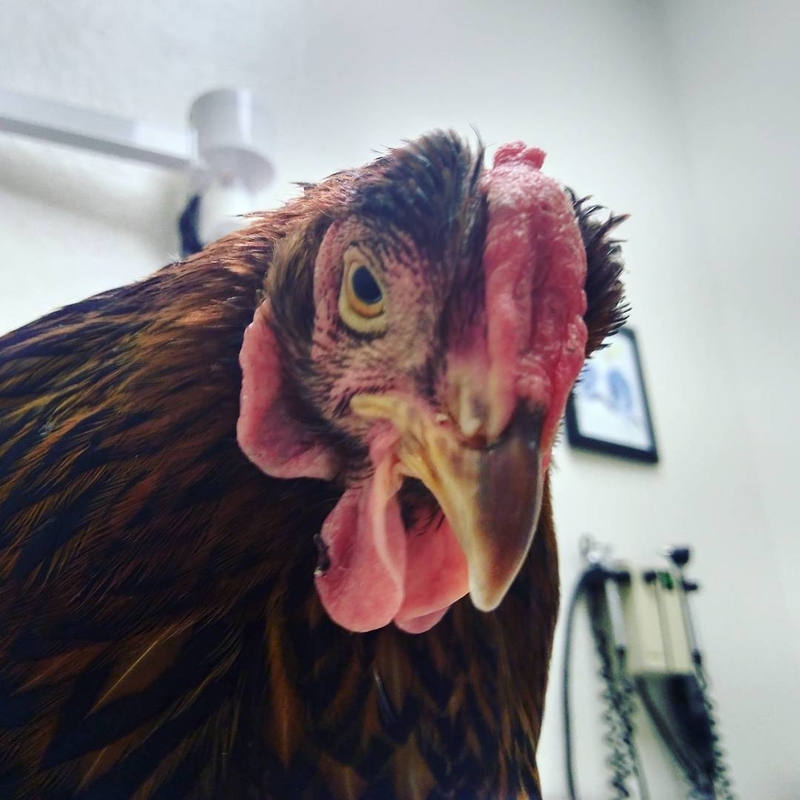 Ariana brought the hen back with her to the Veterinary Clinic, where she was scheduled to receive a salpingectomy (surgical removal of her uterus) with Dr. Thomas. During the surgery, Dr. Thomas also came across some loose, soft-shelled egg material inside her abdomen. Egg material accumulates in a hen's abdomen through ectopic ovulation (internal egg laying), and discontinuous or ruptured oviducts. In order to help reduce the chances of this reoccurring in Scallops, Dr. Thomas removed the hen's uterus; which was later discovered to contain a mixture of hardened and soft egg material. Thankfully, Scallops made it through the surgery okay, however Dr. Thomas was concerned about the fact that the hen woke up quite slowly, and how the hen had a great deal of mucus present when the tracheal tube was pulled from her throat. Ariana picked up Scallops from the clinic the next day, and was amazed by how unexpectedly good Scallops looked---she appeared much brighter than she did before the surgery. Hen Harbor (HH) is a non-profit, 501(c)(3) organization founded in 2012 near Santa Cruz, California. 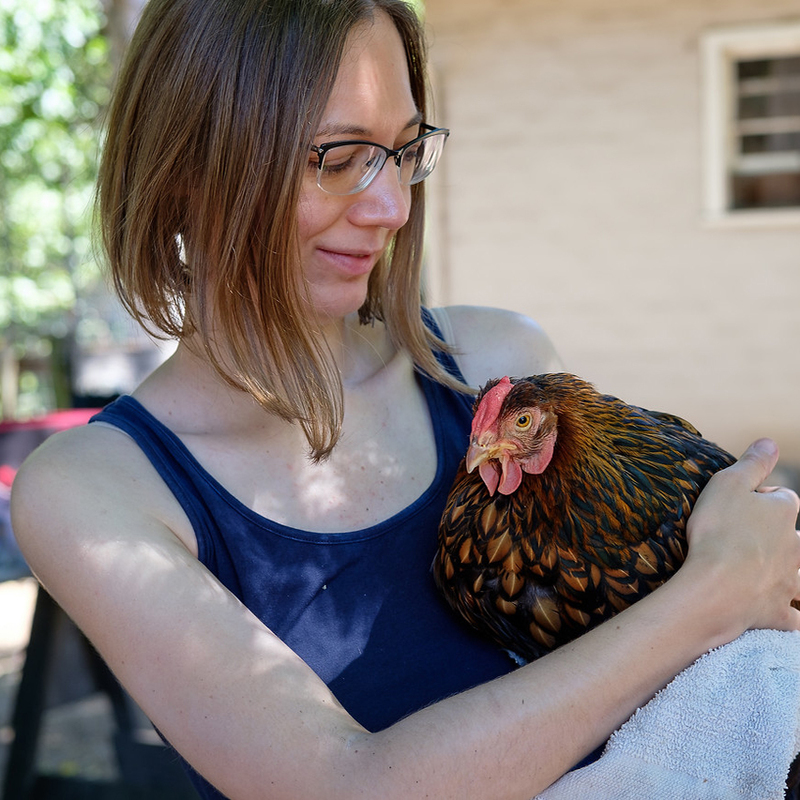 HH's mission is to provide a safe haven for chickens that are unwanted, deformed, rescued from industrial agriculture and other miserable circumstances, allowing them the opportunity to live out their lives in a more natural, safe environment. 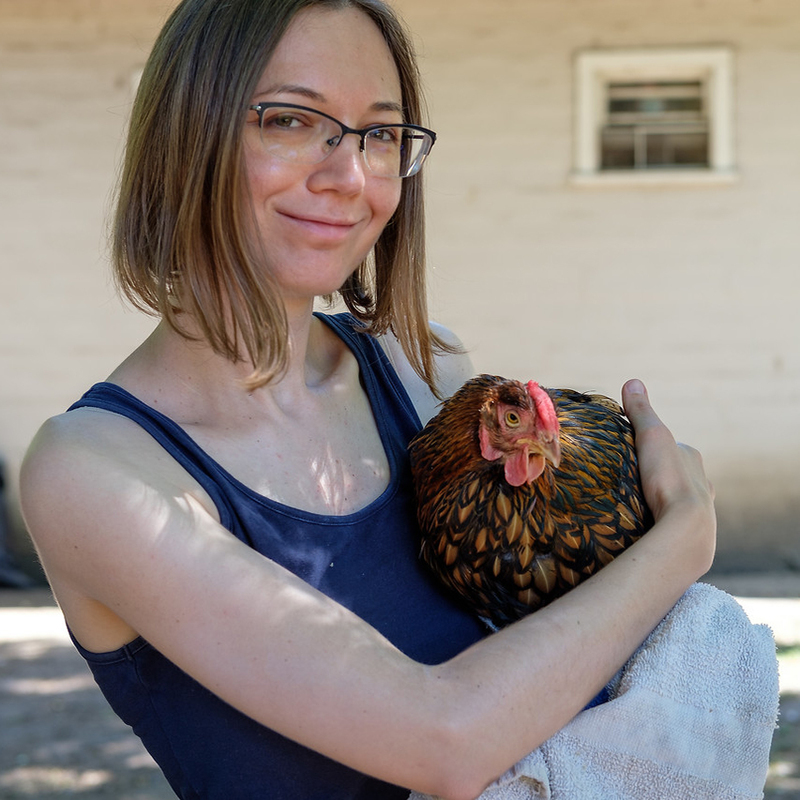 HH's long-term goal is to help shift society’s perception of chickens and other poultry away from thinking of them solely for their ‘production value’, to recognizing them for who they actually are---intelligent, emotional beings who deserve to receive proper veterinary care and the opportunity to live free of cruelty and neglect. HH strives to ensure that each and every bird under their care is given the opportunity to be treated for their illness or injury---thus requiring veterinary care, which is HH's greatest expense. Because the vast majority of laying hens suffer from reproductive problems (the result of the artificial manipulation of their reproductive hormones, through years of selective breeding for ‘increased egg productivity’), as you can imagine, costs add up fast. Please consider donating money to HH, to help them continue to make the world a better place for the rescued birds----a world free of pain and fear, and instead overtaken by love and compassion. 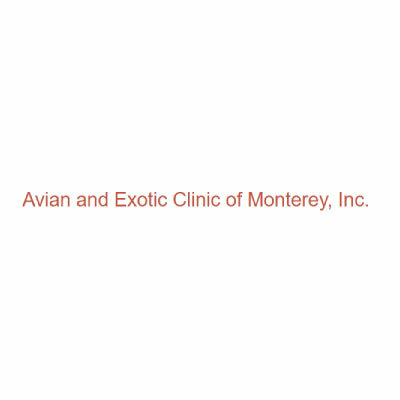 Avian and Exotic Clinic of Monterey is based in Del Rey Oaks, California. The clinic focuses exclusively on exotic pets including, but not limited to birds, reptiles, rabbits, ferrets, rodents, hedgehogs. Additionally, the Avian and Exotic Clinic is the only veterinary practice on the Monterey Peninsula which routinely cares for fish through either office visits or mobile calls.